Also known as "Les femmes dans la mêlée"
"As demands on manpower grow, women are taking an increasingly important place on the various war fronts. 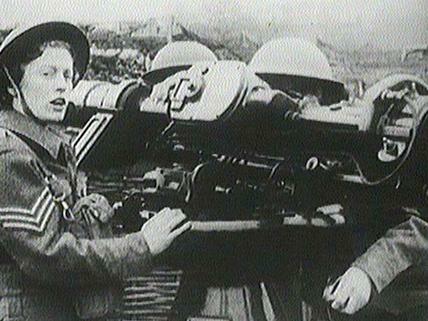 In England, their more active jobs include ferrying planes from factory to airfield, and operating anti-aircraft guns. In Russia, they are fighting on the front lines as well as acting as parachute nurses, army doctors, and technicians. Canadian women, too, are entering new fields every day. Many have joined active service auxiliaries, and thousands labor day and night in factories turning out the tools of war." "John Grierson could match the tyranny of any Hollywood mogul. Jane Marsh's final cut of Women Are Warriors, for example, hardly resembles the ambition of her original treatment on women's contemporary situation. [...] After a final disagreement with Grierson, who refused to let a woman head his 'Canada Carries On' series, Marsh resigned from the NFB in 1944." "The film [Women Are Warriors] ended with a superb montage moving from shots of women in factories to a plane in action, to factory, to plane to factory and plane to demonstrate how important women's roles were to the war effort." "Today Canada, through selective service, urgently seeks solutions for her manpower needs. Women Are Warriors shows how far women in the United Nations have already gone in sharing with men the full risks and responsibilities of war." "Unlike Women at War and Wings on Her Shoulders, Women Are Warriors makes it clear that these women were not leisurely idlers before the war -- they were domestic workers, secretaries, doing whatever work was available for women. But just as the implications of Jane Marsh's original title, Work for Women, were suppressed in favour of Women Are Warriors, so the implications of the film's structure and commentary are suppressed by the use of a male narrator -- the same patriotic, reassuring voice heard in so many films showing men at war." "[Women Are Warriors] reviews the many new and impressive civilian jobs performed by females in various Allied countries. At a British airplane factory, for example, the male narrator describes women 'adapt[ing] themselves easily' to tasks that include 'working on electrical circuits, soldering iron ... working with drills and lathes [and] rivetting sheet metal.'" "The difference between the original script prepared by Marsh and the final version of the film [Women Are Warriors] was quite vast. Comparing the two versions illustrates that some NFB filmmakers were insistent on pushing the envelope even further with their class-based analysis, and that by the end they would settle for solutions that accepted the limitations associated with working within a government agency." "[Women Are Warriors] represents an excellent example of the creative application of the compilation model in NFB films. The film brings together huge pre-edited chunks of British and Soviet footage with practically no NFB-produced material. Marsh's editing approach and her ability to incorporate a multitude of distinct newsreel footage was instinctual with a powerful artistic and political force." "Certains titres de films de ces réalisatrices jugés trop revendicateurs ou avant-gardistes ont été changés pour des titres qui posaient moins de problèmes. C'est le cas du film de Jane Marsh: Work for Women dont on a modifié le titre pour Women are Warriors. Le premier titre proposait trop clairement aux femmes de travailler, c'est-à-dire de prendre des emplois en fonction de leurs talents et de leurs capacités, alors que le second laissait entendre qu'avec la fin de la guerre les femmes retourneraient à la maison et que tout rentrerait dans l'ordre." Globe and Mail. "Women at war shown in movie: August issue of series depicts varied activities." Review of Women Are Warriors. Globe and Mail, August 26, 1942. National Film Board of Canada. "NFB -- Women Are Warriors." National Film Board of Canada. http://www3.nfb.ca/collection/films/fiche/?id=15541.